I put the finishing touches on the HTC last week with a 50 mile gtw backpack trip, a full report will be forthcoming. As some of you know, I'm moving out of this great state of ours for a brief stint in NYC. Thanks to a supportive wife and a mess of free time I've been able to chase down some of my fly fishing goals this summer. The first was the Wyoming Cutt Slam which I posted about earlier. The second has been trying to catch all of our native species here in CA. At this point I am 8 of 11, leaving out only the coastal cutt, eagle lake bow and warner redband. I've been skunked for both the warner and eagle fish after having made my way all the way to the waters in which they swim, which, if you know where they swim, you also know what a long trek it is to get there making the skunking all that much more painful. Focusing on the more positive side of things, I recently took a solo journey down 395and around the south sierra's to fish for our more southern and eastern swimming native fish-the report of which I will now share. Where I was to fish in this valley, which was absolutely loaded with fish. I think the hookup ratio was in excess of 3 fish to 4 casts and I probably had 40 fish to hand in under 2 hours. All in all the trip back in to this valley was pretty grueling involving about a 15 mile loop of hiking. 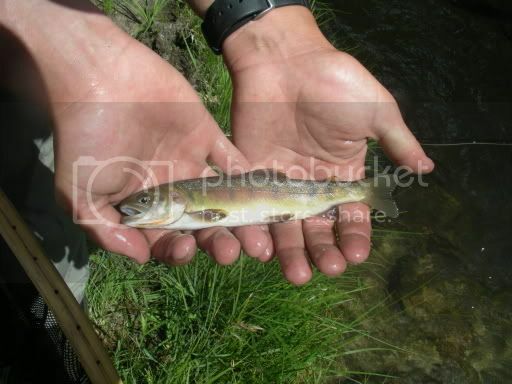 which is the home to the uppermost part of Golden Trout creek. Golden Trout creek was absolutely amazing. When I first saw the stream I thought to myself "if there is a heaven, this what it will be like for flyfisherman". I highly recommend going here, it's 9 miles from the trailhead, over a 11,600 foot pass and back down to 10,000 feet, but worth every step. My original plan was to continue to the kern and head across the wilderness, but being solo I cut it short and headed back east across tunnel meadows to fish the very headwater of the South Fork of the Kern river. There were many goldens here as well, although they seemed to have more spots than the GTC and Volcanoe fish. After another night I hiked out of the wilderness the following day amid violent lightning storms via trail pass where I found my car intact and quickly drove to Lone Pine to eat an entire pizza. The final leg of my quest involved a hike into the forks to fish the main kern. Where I would follow the river trail and head up and over Doe Meadow to connect to the Little Kern, cross the bridge and follow a trail up and out along one of the tribs. The kern was high due to the lightning storms I had experienced a few days before, and fishing was indeed tough. I managed this fish and a few others by stripping floatent-coated birds nests slowly along seams. This was the only way I could seem to pick up fish in the murky water. I Just got back from a month long road trip from Norcal through Oregon, Idaho, Wyoming and Montana. We spent most of our time chasing native fish in remote locals. All told 12 species of game fish were brought to the net, these included; McCloud Redband, Goose Lake Redband, Rainbows, Browns, Brookies, Finespotted Cutt, Bonneville Cutt, Colorado Cutt, Yellowstone Cutt, Westslope Cutt, Grayling and Mountain Whitefish. From here we went up to Lakeview Oregon and spent the night and went out on the town. If you are ever in Lakeview I highly recommend going to the bar. From Lakeview we made the long haul to Sun Valley where we fished the Big Wood and some tribs. Afer spending a few days in Sun Valley we headed on towards Wyoming to get started on the cutt slam. A little later in the afternoon my buddy Steve hooked up, and then a nice mayfly hatch came off and we were treated to some outstanding dry fly fishing. Before too long we all had our first Cutts in the bag and were 1/4 of the way to our cutt slam goal. The next day we drove up past the headwaters of the Greys where the Wyoming forest service has this sign, which we passed right as we were discussing how cool it was to drive the entire stretch of river--from big water down near Alpine to a foot wide trickle up near the pass. After some quick celebrating we headed straight to camp to pack up and go after our next fish: the Colorado Cutt. My pre-trip research had indicated that a great spot to catch Colorado Cutts was in the upper reaches of Fish Creek. So we left the ranch and drove a bit south around the mountains, over to Kemmerer, and on up to Big Piney where we made a left back toward the mountains and the upper reaches of Fish creek. As soon as we arrived we were treated to the sight of countless rising fish in the meadow we were planning to camp at. We got out of the car and geared up as fast as we could with the hopes of some great dry fly fished to rising Cutts. We stalked our first fish and brought a nice brookie to the net. And then another, and another, and another...I have never been so disappointed to catch brookies in my entire life. This continued until dark. The next day we were up early and headed even further upstream hoping to find Cutthroats. We had no such luck and continued to catch brookies as far up as we were able to hike. It was hard for us to leave this magical spot but we were on a mission and we also felt like celebrating a bit so we left and made our way over to Pinedale for some food and drink and a hotel room. We found the food and drink but, unbeknownst to us, we had arrived during the "Mountain Man" festival and not single room was left in the entire town despite the large number of hotels around due to Pinedales rapid growth since natural gas was discovered there a few years back. With no rooms available in Pinedale we decided to drive up toward Jackson and camp along the Hoback river. I figure that I am probably the only person to ever complete the Cutt Slam using the exact same fly for eachof the four species. I'm probably also the only person that has tried. Suffice to say, Big Ugly was retired that night on the north fork and I plan to mount him with my certificate. I also took this picture that night when we stopped fishing. Look closely.